This is a quick and easy Halloween tech project that uses items you might already have or could use for other purposes. You'll need a smartphone or tablet plus a compatible wireless bluetooth speaker. 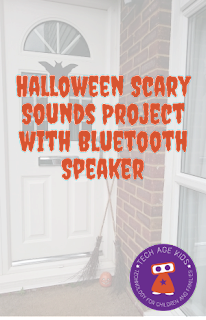 Kids will be able to remotely play scary sounds on a mini speaker using a phone or tablet. We've got a cheap speaker that is intended for use in the shower and has a sucker on the back. This makes it ideal for mounting outside and using to scare (or delight) trick or treaters who turn up at the door. Warning: Please encourage kids to be responsible with who they scare. See also: our Halloween FizzBit Spider, Light Up Minecraft Diamond Sword and Bat Detector projects. 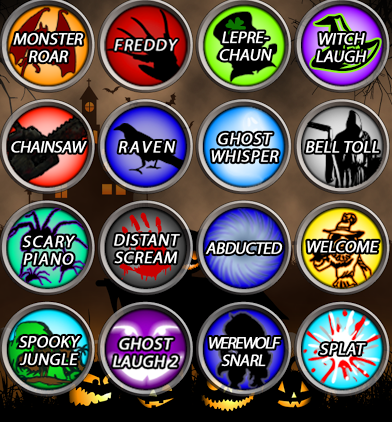 Then find a Halloween sounds app and install in on your phone. We recommend using an app rather than a website so that the project works even when you don't have wifi. Scary sounds available as music tracks would also work if they're downloaded to the device. 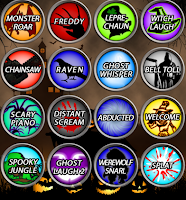 We used Halloween Spooky Sound Box on iOS. There is a free version of this app with (lots of) ads which is rated 9+ and has a smaller selection of sounds or a paid version which is rated 12+ and has more sounds. Check the sounds first to make sure they're suitable for your child - all kids are different. Now kids can remotely play scary sounds for a Halloween surprise. Now hide somewhere where you can see or hear people approaching the front door and get ready to play scary sounds. My kids had great fun scaring their Dad when he came home. Another fun option is to use the TinyBop Everything Machine iOS App to generate sounds. The Everything Machine is a brilliant app that allows kids to connect up the sensors and outputs on their iPhone or iPad to create their own machines. If you can connect your PC to your Bluetooth speaker then that gives you lots more options. 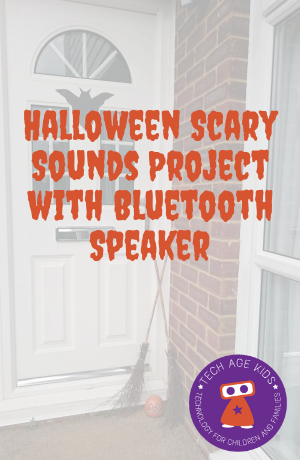 Kids could record their own Hallween sounds and trigger them from a computer. Less portable than using a phone or tablet, but fun for surprising trick or treaters from inside the house. We've got our Shower Speaker working with our kids laptops so that gives them lots of options for generating sounds. You can also use a Bluetooth speaker to add sound effects to a Halloween costume. These can be controlled by the costume wearer from a phone or for younger kids by a parent.